John Meadow’s latest book with light-hearted travel stories is now out. Read an excerpt from it (and read our special interview with John Meadow here). 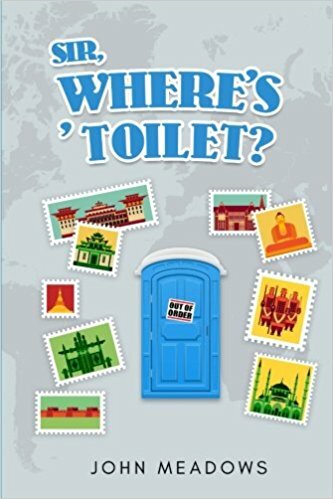 ‘Sir, Where’s ’Toilet?’… What kind of a title is that for a book? Let me explain: It is a question that has haunted me for thirty years. It has followed me through Tiananmen Square, Red Square and Times Square; from the Great Wall of China to the Golden Gate Bridge and the Grand Canyon. It is a question which has echoed along marbled, hushed corridors of museums from the Prado, the Louvre, the Uffizi and New York’s Guggenheim. I have come to the conclusion that school children seem to think that their teachers spend years at University exclusively to acquire an encyclopaedic knowledge of the precise location of toilets anywhere on earth; like a London cab driver who has passed ‘The Knowledge’. At least these days, cabbies have got Satnavs, so perhaps one could be invented for teachers in charge of school trips: Satlavs. After an overnight flight to China, we were greeted at Beijing Airport by our Chinese guide, Drin. We were all fighting the effect of jet-lag, but nevertheless our host gave us an overly long introductory speech. Amazingly, he then began to sing to us in Chinese. We were amazed at what we heard. How can I describe his distinctive voice? The excruciating sound of fingernails scratching down a blackboard could describe Drin’s singing. He shouted in a throaty style. To be fair, he did occasionally come quite close to the notes he was straining for as he changed key more times than the driver changed gear. He couldn’t hold a tune in a wok. No one fell asleep for the rest of the journey. Perhaps it is a traditional Chinese cure for jet-lag. When Katie Melua sang ‘There are Nine Million Bicycles in Beijing,’ I think she greatly underestimated the number. The dedicated cycle lanes were a flowing river of humanity. Everyone on the coach was fascinated by the ingenuity of the local cyclists and a competition developed to see who could spot the most outrageous riders. “Sir, look at this one,” pupils would shout, while pointing at the most hilarious modes of transport. A family of four on a bike was quite a common sight. We saw a man with a settee strapped to his bike, with three kids actually sitting on the couch. My favourite was a painter and decorator riding his bike while carrying on his shoulder a bamboo ladder; his buckets and tins of paint swinging on the handle bars. He was towing a trailer, a converted pram, which held his decorating table, brushes, rollers and rolls of wallpaper. I doubt if he was breaking any Chinese traffic laws, but he certainly defied Isaac Newton’s laws of motion and gravity. It was a Jackson Pollock waiting to happen. Most incredible of all was a moped which passed in front of us at a junction. The passenger was holding a large gilt-framed mirror, about 3 feet high by 4 feet wide, about the limit of his outstretched arms. It created a disturbing optical illusion which caused us to become disorientated. Even the driver shook his head at that one. On reflection, a dangerous manoeuvre. Add to this scene a multitude of boxes, cages containing a wide range of live animals and birds, all perched precariously on each bike. A menagerie of who-knows-what, probably on the way to a restaurant. Just when we thought we had seen everything imaginable, the coach began to slow down, and a pupil claimed first prize for spotting the most bizarre sight of the day. In the middle of the road ahead, a policeman, whistle held tightly between his teeth, was animatedly directing vehicles to follow a line of luminous orange traffic cones which filtered us into another lane. This took us past a hole in the road which could have easily swallowed a bamboo ladder, if the occasional decorator happened along on his bike. The hole was completely encircled by further traffic cones, which caused everyone on the coach to laugh uproariously. Now what is so hilarious about a scene which is commonplace all over the world, particularly in Britain. Let me add just one more small detail. Each cone was being worn on the head of a Chinese road mender. They were sitting cross-legged in a row leading to the manhole, like pupils wearing dunce caps in a Dickensian school. A row of human traffic cones, sitting inscrutably, like a line of Buddhas searching for enlightenment, hopefully before it went dark. They looked as if they were meditating, probably wondering why their chosen career path had been diverted. I’ve heard of human trafficking, but that’s ridiculous! Possibly the most dangerous occupations in the world are bomb disposal, astronaut, deep-sea diver or a lion tamer. I think a human traffic cone in Beijing should be added to that list. Our first excursion could only be to one place: The Great Wall of China. It is over 1500 miles in length, stretching over mountains and deserts. It was designed to be the width of four horsemen, and it can be surprisingly steep between the fortified watch towers. Its origins can be traced back as far as the 7th Century BC, when several walls were built as protection from invasion from the north. Over centuries they were joined together, and especially famous is the section built in the 3rd Century BC by the first Emperor of China, Qin Shi Huang. His joining together of the sections of the Great Wall could be described as a metaphor for his joining together of rival states into one great nation. China takes its name from the first Emperor: Qin is pronounced Chin. We arrived at the Great Wall at a place called Badaling. All of our group, and it seemed every other tourist, bought a lavishly embellished certificate which proudly declared; ‘I walked on the Great Wall of China’. The local craft market adjacent to the Great Wall dazzled with colour: There were opera masks, paintings, ornaments and sculptures made of jade and onyx, and Chinese cloisonné (metal and enamel work) of vases, brooches, necklaces and bracelets in blues and turquoise. Brightly painted kites were based on fish, dragonflies, birds and butterflies. We stopped at a stall selling T-shirts, and I chose one with an illustration of the Great Wall covered the whole of the front. It was so big it could probably be seen from outer space. I tried it on for size. “What do you think?” I asked proudly, extending my arms. And I thought Chinese food was non-fattening. 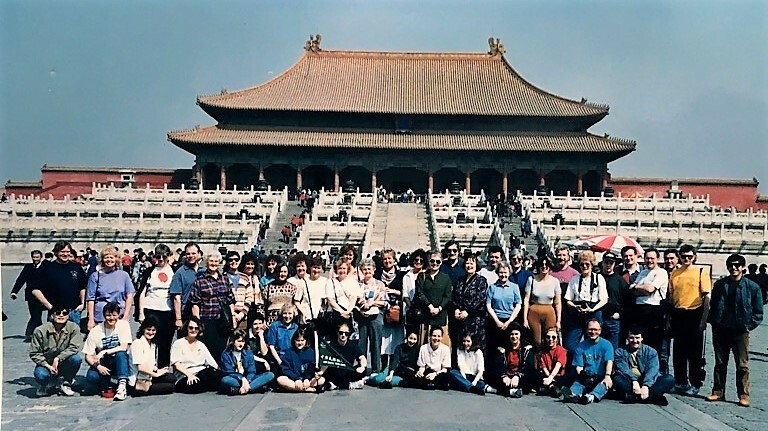 “John, we certainly don’t get bored on any of your trips,” announced my friend and colleague George, while carrying his suitcase from the coach to Beijing railway station. Our party had to snake its way through a sea of people who were sitting, huddled in groups around their belongings. We literally had to step over people as we negotiated this human obstacle course. At least the huge concourse was less crowded, and we were able to walk in a straight line towards our overnight train to Xian. The station area was so crowded because it was a holiday and all the people were returning to their home towns or villages. The authorities would only allow them into the station concourse nearer to the departure time. It was lunchtime on a bright sunny day as the sleek silver train pulled out of the station, and everyone started to socialize along the corridor. “Sir, they’ve got pot noodles in the buffet car,” shouted a couple of pupils, unable to contain their excitement. I must admit that the style of Chinese food we had experienced had differed greatly, depending on which region we had been in. On the train, most of our pupils seemed to be connoisseurs of the gastronomic delights of pot noodles; how much hot water to add, when to stir and how long to let it stand. Our staff were fascinated, but we chose from the menu. After all the crowds of Beijing it seemed almost another world as we watched the endless Chinese countryside roll by. Workers in rice fields, ox-drawn carts piled high with produce, children playing; a scene which will have changed very little over centuries. It was as if a silk roll of Chinese landscape painting was being unfolded before our eyes. Xian, which means City of Everlasting Peace, is famous today as the home of the terracotta warriors, but it is also one of the most important cradles of Chinese civilisation. Our itinerary included The Wild Goose Pagoda and the Banpo Neolithic village museum, dating back 6000 years. Xian marked the start of the famous ‘Silk Road’ which linked China with Central Asia and the Roman Empire. The city is so steeped in history, above and below ground, that there can be no underground railway system, even though Xian has a population of over 7 million. Contrary to widely held belief, the discovery of the terracotta warriors was a relatively recent event. During a drought in 1974, a local farmer called Mr Yang from Xiyang village, was desperate for water to irrigate his fruit crops and so he started to dig a well. He came across some broken pieces of terracotta, which means baked earth, and at first he thought it might be a hidden temple. He was initially dismayed because it would have had a negative effect on the Fen Shui of the farm land. Subsequent archaeological excavation revealed the site to be a burial pit of a huge subterranean terracotta army for the afterlife to guard the tomb of Qin Shi Huang. Thousands of bronze arrow heads were found alongside sophisticated bronze mechanisms, which research proved to be triggers for powerful cross bows. The terracotta army was a wondrous discovery which caused astonishment all over the world. And yet, if the farmer had started digging just a few feet away in a different direction he would have missed the site completely and the terracotta army could possibly still be undisturbed and unknown to us to this day. No-one would have been looking for them because there are no written records, images or myths to tell of their existence. This makes the discovery all the more miraculous. Considering the magnitude of his discovery, I’m surprised that the farmer, Mr Yang isn’t as world famous as, say, Howard Carter, who discovered the tomb of Tutankhamun in Egypt’s Valley of the Kings in 1922, or Hiram Bingham who found Machu Picchu, the lost city of the Incas in the Andes of Peru in 1911. Subsequently, three burial pits were found and given the very imaginative names of: pit number 1, pit number 2, and yes, you’ve guessed it, pit number 3. I’m not sure what I was expecting to see as we arrived, but, having been to the Forbidden City and the Ming Tombs in Beijing, I thought that there might be a building rich with Chinese Imperial traditions. However, the structure which houses the warriors looks more like a railway station or a sports hall, spanned by a barrel-vaulted roof with a row of skylights. It seems incongruous that such an unimaginative building should be home to one of the most magical creations in human history. From the viewing platform, I looked down upon the terracotta army, each soldier facing forward, standing to attention, waiting (for over 2,000 years) for the order to march. They are in battle formation in excavated trenches of infantry, cavalry and charioteers flanked by archers. Traces of pigmentation indicate that the soldiers were originally painted to appear lifelike, wearing red armour and green tunics and there is an array of expressions, facial features, facial hair and individual hairstyles. They were not mass-produced clones. The army must have looked terrifying and the warriors still maintain an intimidating presence today. After 22 centuries underground, they are now the familiar monochromatic figures which are famous the world over. Personally, I felt that it was quite a poignant scene. They are not dissimilar to the sepia photographs or black and white newsreel images of 1st World War soldiers in the trenches of Passchendaele and The Somme. Both armies waiting for the order to send them over the top. Sadly, it seems that the one constant of human history, anywhere, anytime, any culture, is war. When will they ever learn? We walked around the perimeter of the hall as the warriors maintained a forward gaze. You know when you look at a portrait in an art gallery and the eyes seem to follow you round the room? (Or Chairman Mao in Tiananmen Square) I kept getting this unnerving feeling that I was being watched. An eerie feeling; I wouldn’t like to get accidentally locked in overnight. As I emerged from viewing the Terracotta Warriors into the bright sunshine, I was met by an excited group of pupils. “Sir, we’ve volunteered you to become the Emperor Qin of China,” they laughed. Not something you tend to hear every day of the week. They led me to a fenced-off area in the centre of which was a full-size replica of a terracotta horse. I was greeted by one of the resident photographers who dressed me up in a traditional Chinese outfit. It was a full-length ceremonial robe made of golden Chinese silk, richly embroidered in blue. It was topped off with a mortar board which had a curtain of beaded tassels. So, the only times I have worn a mortar board were when I graduated, and when I was Emperor of China. The laughter and applause from our pupils attracted other tourists, and I soon found myself being paraded around to pose for photographs being taken by people from all over the world. The biggest laugh came when I had to mount the horse. Of course, I couldn’t resist playing to the gallery as I hammed it up and encouraged the terracotta horse to ‘giddy-up’ by enthusiastically pulling the reins and digging his side with my heels. “That horse doesn’t look very happy with you on its back,” shouted George. “That’s because it has just realised that it will be carrying top weight in the next race,” jeered Roy. Roy and George were gradually morphing into Statler and Waldorf from the Muppet Show. As with all our tours, it was over far too soon and the following day we reluctantly waved goodbye to China. During the coach journey from London back home to Wigan, I chatted to the pupils and asked them about their favourite memories. Several of our younger girls were unanimous in voting for the pandas at Beijing Zoo, as they all waved their souvenir cuddly toys. After further careful consideration, he stroked his chin and finally came to a decision.